Gigantic French 400mm Shell Being Hauled to the Gun Breech - full page (fp). FP titled With Brussiloff and His Redoubtable Russians x5photos: Infantry Trench in Bukovina - General Alexei Brussiloff Talking to His Men - Russian Officers at the Staff Quarters miel of a Division - Escorting Austrian Prisoners. Battle of Fromelles: Anzacs Occupying a German Trench - fp drawn by Stanley L. Wood. A Giant Periscope Captured from the Germans. German Prisoner Cleaning Some of the Captured Guns and Trench Mortars. Prisoner Assisting A Despatch Rider Stuck in the Mud. A Holt Caterpiller Tractor Hauling a Gun. A Machine Gun Section Masked Incase of Gas Attack. British Machine Gun Section at Practice in Flanders. 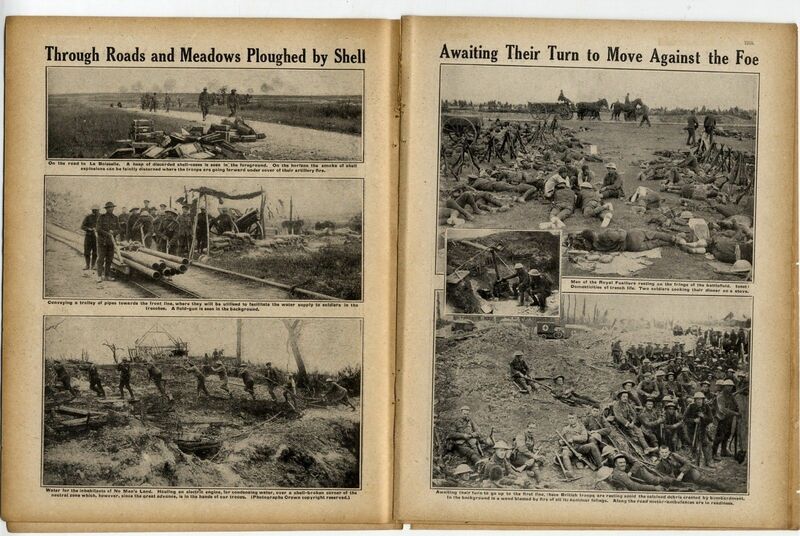 On the Road to La Boisselle: Troops Passing Discarded Shell Cases etc. British Conveying a Trolley of Water Pipes Towards the Front Line. Men Hauling an Electric Engine for Condensing Water over a Corner of No Man's Land. Men of the Royal Fusiliers Resting oN the Fringe of the Battlefield. Two Men Cooking Dinner on a Stove - inset. British Troops Waiting Their Turn to Go To the First Line, Resting Amid Calcined Debris Created by Bombardment. Canadian RAMC in The Advance. Indian Lancers Study a Map in the Heart of the Battle Zone. 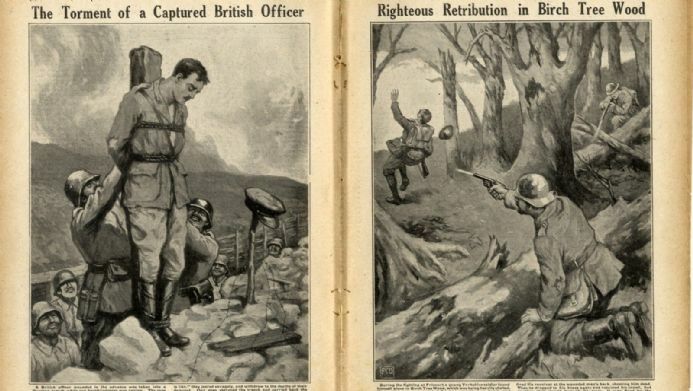 The Tournament of a Captured British Officer - fp from a drawing. Fricourt: Righteous Retribution by a Yorkshireman in Birch Tree Wood - fp from a drawing by FCD. Captain Charles Fryatt the Captain of SS Brussels Who Was Executed by the Germans at Bruges. 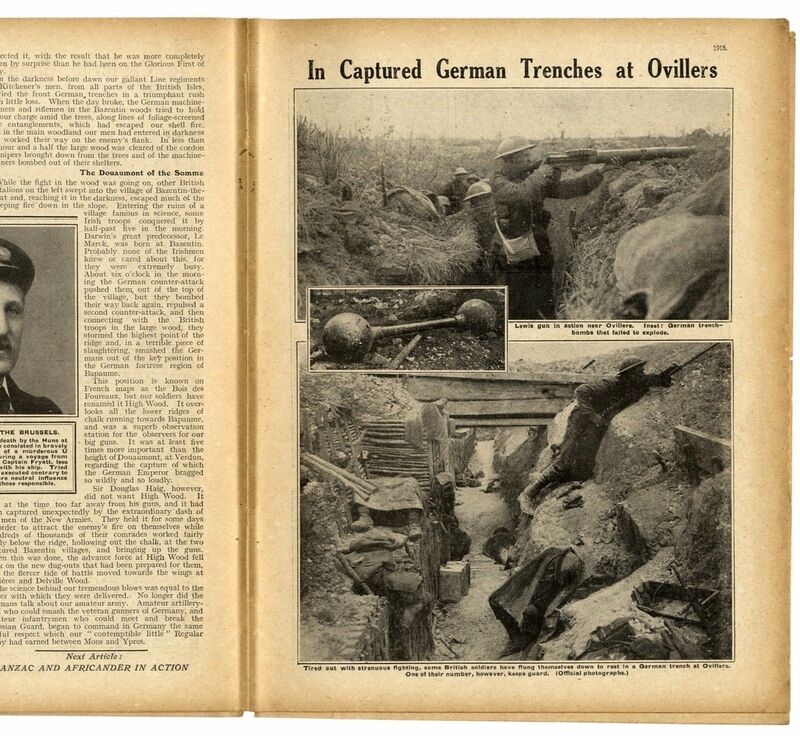 Captured German Trenches at Ovillers - fp showing x3 photos. General Cadorna the Italian Leader Laughs with Staff Officers. Second Lt. McCubbin the British Pilot Who Brought Down Imelmann the German Avaitor. Remnant of the Original British Expeditionary Force Now Quartered in the Tower of London. General Marchand and an Aviator About to Make a Flying Tour of Inspection. General Gilinsky Decorating French Women Muniton Workers by Order of the Tsar of Russia. Gordon Highlanders on the March and Pushing a Wounded German on a Wheeled Stretcher. Submarine Officer at the Periscope - fp from a drawing. FP titled Labour and Leisure in the Western Advance x8photos. showing British soldiers etc. Pipers of the Black Watch Celebrate a Victory Returning from the Trenches. Pipers of Black Watch Playing to their Comrades Resting Along a Rail communication in the Region of the Fighting. Piper A. Boyd Who Played His Company Over the Parapet in the Attack at Albert. Battery of Belgian Anti Aircraft Guns on Revolving Pivots. 75mm Mortar on a Hand Trolley. 210mm Belgian Siege Mortar Gun. A Church at the Moment of Being Struck by a German Shell in a Flemish Village - fp from a photo. Mr Hamilton Fyfe - small photo. Russian Fighting Men by Hamilton Fyfe Special Correspondent with the Russian Army. Coast Watchers - by One of Them. Storming the Bazentin hills by Edward Wright - info. Battle of the Somme. Chronological List of Events for the Month. With ref. to the Somme - La Boisselle - Ancre - thiepval - Russian Offensive in Volhynia - Longueval - Delville Wood - Reive - Pozieres - Erzindjan - etc.